I call this necklace my "Michigan special". 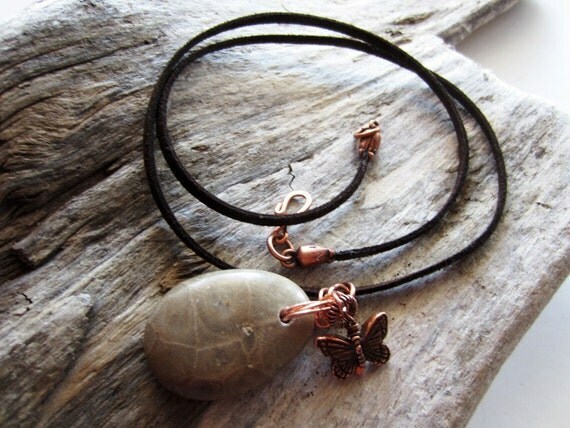 Made with a genuine polished Petoskey stone, an antiqued copper butterfly, and wire wrapped copper (which is native to Michigan), it's a lovely rustic reminder of all things Michigan. The faux suede cord in rich chocolate brown which measures just over 21 inches, or 53 cm, is capped with tulip design bead caps in copper, and closes with a handmade, hammered hook and eye clasp. The Petoskey stone measures 7/8" by 1 Â¼" and hangs 1 Â¼" inches further below the cord. A gorgeous, earthy addition to any fall wardrobe. The Petoskey stone is a type of fossil coral that is native to Michigan. This piece is a medium grey, and exhibits a nicely defined pattern. Folksy :: Buy "Beautiful Translucent Fossil Coral Pendant in Sterling Silver"